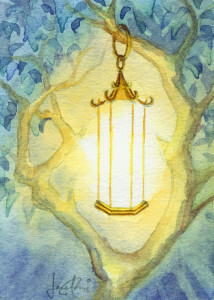 The Lantern: A 2.5×3.5-inch painting. Plane travel, sick kid, sick dog and school vacation means I’ve been extra taxed lately. I got the bright idea to insist that my sleep time be used for healing as much as possible, healing others only after myself (as happens sometimes with my “dream Reiki services”). I am happy that last night, I had a dream where I could watch the process of my chakras being worked on one by one, with healing colours (in mandalas) and music. It was something quite lucid for me as it happened, but all I could remember after waking up was the colours and music, but not the details! I must have gotten enough healing because I got a “normal dream” in the second half of the night. I was very happy with that. And highly recommend the practice if you know your helper team is equipped for it–just know they are!